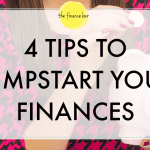 There’s plenty of good advice, freely given on blogs in books and in the news, about how to manage your money. And then there’s plenty of terrible advice, and it comes from every direction. Instead of telling you what to do (or what not to do), I want you to focus on the things you’re already doing right. You already have good habits, and building on those foundations will help you create the financial life you desire. You’re swiping your debit card, or paying in cash, more often than you’re paying with a credit card. If it’s been easier for you to pay with a credit card in the past, and now you have some consumer debt, this can be a hard habit to break. It was much easier to think about paying things off later. Now, you’re paying attention to how it feels different to pay for something with cash instead of a card or even an app. You know that every time you pay with real money, you get closer to your financial goals. You’re taking responsibility for your spending, and you’re making progress. 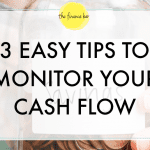 You’re checking your bank balance regularly and paying attention to cash flow. It’s easy to ignore your banking app when you’re feeling anxious about your finances. Owning what you earn—and what you owe—is part of understanding your bi-weekly or monthly cash flow, and it helps you conceptualize where you want your money to go. Lately, banking apps have also been full of advice, offering built-in budget trackers that rarely show your whole financial picture. If you can tune out that noise and stay true to yourself and your goals, you’re doing it right! You’re finding cost-friendly alternatives that are just as satisfying as spending. Whether you’ve committed to making coffee at home or bringing lunch at least three times a week, you’ve been making sacrifices big and small on behalf of your overall financial health. With winter coming, you’ll be looking for activities that keep you cozy at home and don’t break the bank. Whether you’ve found a new podcast to get into or a new favorite series to binge-watch, you’ll be spending a few more nights enjoying your home—that you already pay for—and keeping more money in your pocket. You might even have a plan to turn a favorite hobby into a side-business, so you’ll actually be earning in your downtime. 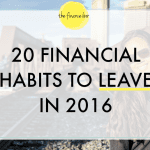 You’re tracking your finances and staying open to learn from your mistakes. 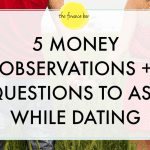 We all have weak spots when it comes to spending and saving, and knowing what they are is a great first step to solving them. By tracking your finances, you know exactly where your money is going each month, and you’re learning your own habits so you can be conscious of them in the future. There are millions of places to spend time on the internet, but if you’re choosing The Finance Bar, then I know that you are already thinking about your issues around money, and you’re committed to making your financial life a little better. Today, I want you to accept yourself, exactly where you are, on your journey to financial freedom. There are many paths forward, but only you know your personal situation and the way that’s going to work best for you. By focusing on what you’re doing right, you’re able to feel good about all you’ve done so far, what you’ve learned, and take another step toward your financial goals. Trust me, if you’re here, you’re doing just fine.